'Ground Zero Mosque': Latest In A Litany Of Killer Phrases : It's All Politics They're three little words that fit perfectly on cable TV news screens -- the screaming tabloid headlines of our time. That they're inaccurate and misleading doesn't seem to matter. GROUND ZERO MOSQUE. The phrase sums up a controversy in terms so vivid and concise that neither journalists nor water cooler pundits can resist using them. Even if you put the words in quotation marks, on paper or in the air, the powerful combination works its magic. Of course, the phrase is also inaccurate and misleading. But how much does that constrain us when a phrase is so catchy and touches such a resonant emotional cord? Several months ago, the idea of an Islamic center at the site of a Burlington Coat Factory store in lower Manhattan emerged as both an urban renewal plan and a local issue in New York. 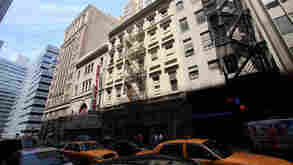 The storefront to be replaced is two blocks from where the World Trade Center towers stood on Sept. 11, 2001. 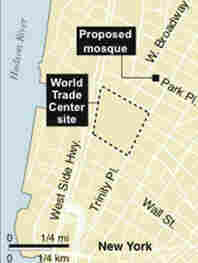 The new center would be one block closer to ground zero than the Masjid Manhattan, an existing mosque. Given the basic facts, the story received local attention in New York and popped up on some talk shows. There were questions about the appropriateness of the site, but the discussion was muted and localized. There were objections from some families of 9/11 victims, expressions of support from others. Mayor Michael Bloomberg and other local officials were on board for the building, which would have multiple functions, including a gym and a prayer space that would function as a mosque. There would be a governing board with non-Muslims on it. Not a few conservatives shared the opinion that the location offered a perfect contrast between American religious freedom and the benighted intolerance of the Taliban. But then we moved into election season. It's a pushback year and Republicans are on the march. For candidates competing for the "more conservative" label, the chance to exhume the ghosts of 9/11 was too good to pass up. Of course, the actual facts of the case were somewhat complicated. But the need to explain the case was obliterated by the emergence of the perfect phrase: Ground Zero Mosque. Say those three words, and no further facts or explanation are necessary. It instantly conjures the image of a massive Islamic shrine, bristling with minarets, rising from the ashes of the World Trade Center site itself. One can practically hear the voices crying "Allah akhbar!" and see thousands of Muslim faithful, kneeling in ranks, bowing to Mecca, hating America, conspiring against us. Right over the ashes of the martyrs of 9/11. So conceived, the whole idea is monstrous. And not true. But oh, what a marvelous topic to fill the endless August hours on cable TV and radio talk shows! And what perfect grist for the political ad mills, including a video from Liz Cheney, daugher of the former vice president, featuring survivors of 9/11. All under the banner that never stops waving across the telescreen: Ground Zero Mosque. It's not subliminal, it's begging you to see it. Even President Obama felt he had to comment, affirming first the right of Muslims to have a center where they wished and the next day questioning the wisdom of the site they chose. He might have defended either position, or even both. But if he had hoped to calm the storm, he failed. And so Ground Zero Mosque joins an elite list of catch phrases with the power to kill. Thinking back over just the last few years, the closest cousin in killer terminology may have been the "Arab takeover of U.S. ports" that blazed across the media firmament in February 2006. A Dutch firm that had been managing terminal operations at several U.S. ports sold that part of its business to Dubai Ports World, an international consortium based in the United Arab Emirates. As best as anyone could determine, the effect of the sale was nearly nil. The same people would go on handling the same operations at the ports and the same government agencies would supervise customs clearance and security as always. But to hear some politicians in both parties and countless media commentators tell it, Osama bin Laden himself was going to be running the Ports of New York and New Jersey. Here again, there had been plenty of advance notice of the sale to Dubai Ports World, which was announced in The Wall Street Journal months before the controversy emerged. But then, the original headline did not say anything about an "Arab takeover." Killer phrases work in other highly emotional areas of political discourse as well. If you wonder why the current Congress has not taken up a comprehensive overhaul of the immigration laws -- so obviously overdue -- it is because of what happened the last time they tried. The bill supported by President Bush and the majority party in the Senate died in 2007 as soon as opponents got the word "amnesty" into wide circulation. Supporters such as Sen. John McCain endlessly explained the actual procedure for illegal residents to achieve legal status. Then their adversaries would repeat the word amnesty in every sentence and the discussion was over. More recently, the new health care law enacted this year barely survived the assault of two killers: "death panels" and "government takeover." The former, popularized by Sarah Palin and others who operate both as politicians and TV pundits was based on the existence of end-of-life counseling in the bill (a feature that had to be expunged). The latter, an update of the old "socialized medicine" (which sounds less lethal in the era of social media) helped kill the "public option." That was the key element in the legislation that offered a government insurance plan for those unable to get private insurance. The word "quota" was once enough to block civil rights legislation that included affirmative action targets and any time the word "private" gets in the same vicinity as "Social Security" there is hell to pay. The list goes on. Maybe "anchor babies" will be scary enough to end birthright citizenship for the next generation of newborns. And the killer catch phrase grows deadlier as our daily media experiences are reduced to ever shorter moments of attention.